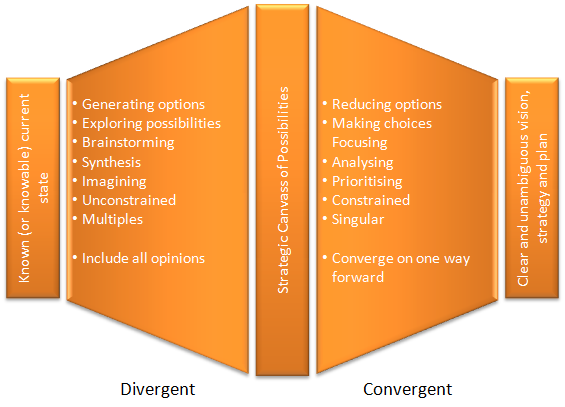 A strategic process alternates between divergent and convergent processes. Divergent processes are about harnessing diverse opinions and perspectives to generate new options, alternative, scenarios and insights. In divergent thinking, within limits, more and more different is better. Convergent processes, on the other hand, are about evaluating, prioritising, making choices, and ultimately aiming for one single and clearly defined answer. Too little divergence results in bland, undifferentiated, ‘me-too’, magnolia strategies. Too little convergence results in lack of focus and alignment, and ultimately in failed execution. When you are constructing your strategic planning process, it is important to understand which parts of the process are divergent and which are convergent. You can do this at the micro level or at the macro level. For example, you could pursue some months of divergent thinking followed by some months of convergent thinking, or you could facilitate divergent thinking in the first have of a meeting and convergent thinking in the second half of the same meeting. Part of the process facilitator's role is to know which process to apply when, and to manage the transition from one mode to the other. It can be incredibly frustrating for everyone involved if some people are being divergent while other people are simultaneously being convergent. It is also worth considering that some people are better at divergent thinking, whilst others are better at convergent thinking - at the risk of stereotyping, we might think of these as creatives or implementers.